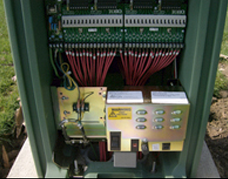 We offer this service on new irrigation systems or we can re-program your existing software. It doesn’t matter whether it’s Toro, Rainbird or Hunter. We have the experience to assist you with your small or large programming needs. We offer competitively priced satellite upgrades and change-outs for all types of irrigation systems. We can handle all of the new station wiring, splices, sequencing, communication, power and grounding. We complete the job with a test of every new station and check communication from the central. Not sure where to start and how to find the time to inventory the new stations and program them into the central? Our “Turn Key Upgrade Package” combines all of your needs without you having to worry about one detail of your upgrade. Provide customer training on central computer and mapping systems.